Calella is a fishing village, about 50 kilometers to the North of Barcelona. 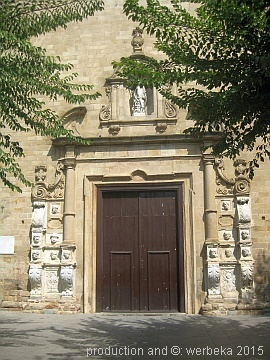 In 1528 a parish was established here and the building of a church started immediately. It was put under the patronage of Virgin Mary and Saint Nicholas and consegrated in 1564. Today's church replaced the old one. 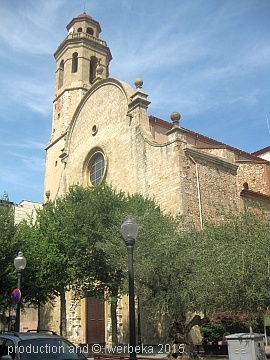 About 200 years later the building started and at the turn into the 19th century the new church stood ready. Today it is nearly empty, because in 1936, in the civil war, it was set on fire. 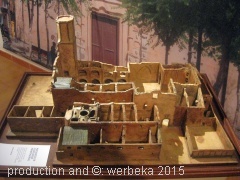 Below you see a model of the church after the fire. 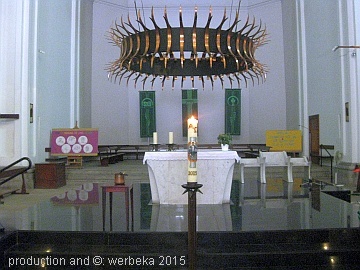 The altar consists of a small table, above which there is a big, stylised crown of thorns. The church doesn't have a pulpit - a simple bookhold must serve for the sermons. It is impossible to imagine all those cultural values, that have been lost in different revolutions and wars - and still are lost. How many books, buildings, paintings, sculptures and other treasures have fallen victim to some ideology, no matter if that happend in the Anchient World, during the French Revolution or today, caused by bombs or the IS! And all of that rather often in the name of God! 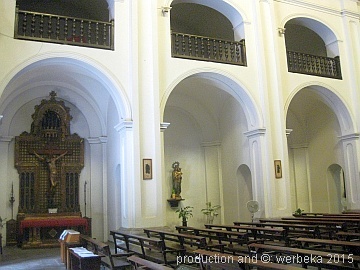 In the very short transept to the right there is a statue of Saint Christoph ( by Josep Espelta in 1962), the patron of cardrivers - and on the opposite side (see picture) "Our Lady assumed into heaven" by Nolasc Valls in 1952. 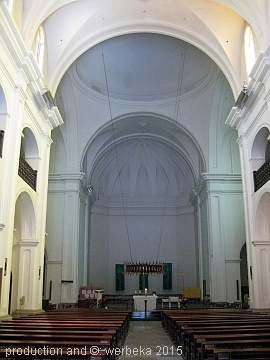 The nave is 49 metres long and is flanked by chapels on each side. Those are connected to each other by semi-circular arches. That is why in the chapels one gets the impression of the church having two side aisles. In the chapels there are some elaborations, which all were fabricated after 1936, though. 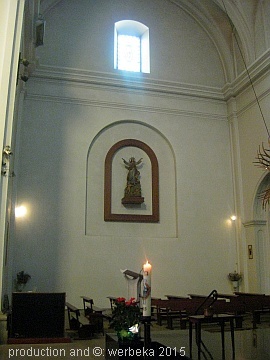 One of the most beautiful is the altar av Virgin Mary in the chapel to the right, next to the entrance. 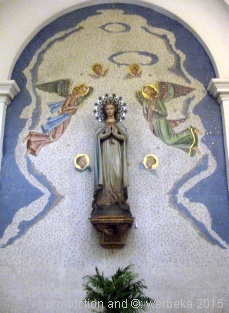 This piece of art was accomplished by Jaume Martorell in 1957 and honors "our Lady from Fatima". 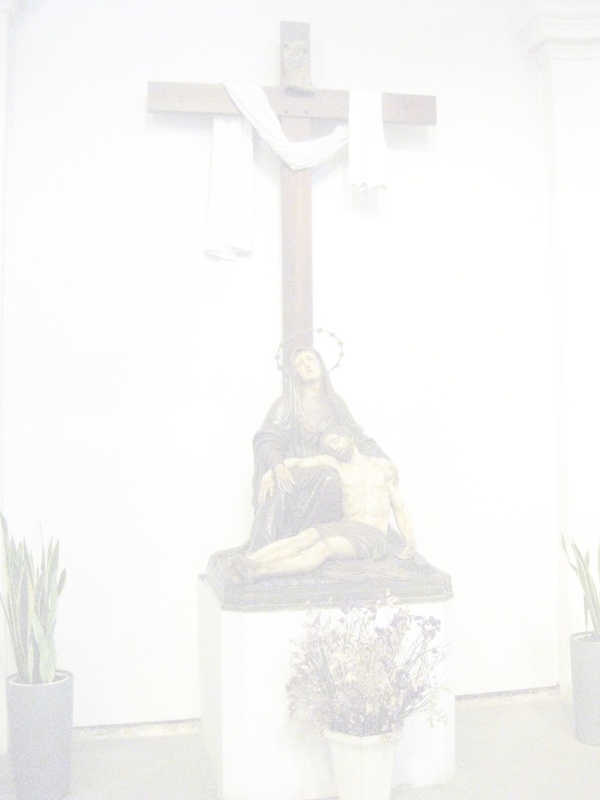 In the next chapel but one we find Holy Lucia, created in 1947 by Josephs M. Brull and donated by the textile workers of Calella. 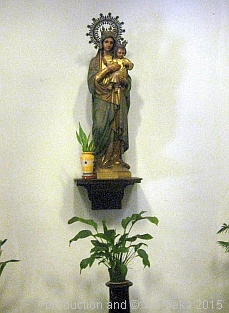 Another image of Virgin Mary, "the mother of the most Holy Heart" is from the year 1954. The steeple, where the bell is placed, is 42 metres high. 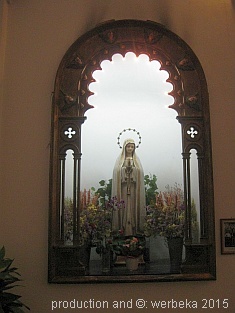 The simple port is surrounded by the heads of the twelve apostles. They were carved by Johannes von Tours, already in the year 1580. Above the port there is a statue of Saint Nikolaus. This is of newer age, from 1974.